Whether we’re developing a game for the general consumer market, or developing a platform of games tailored for the specific audience of our clients, we don’t pull our punches. Artwork should be appealing, UI should be self-explanatory and unobtrusive, controls should be intuitive and the game design needs to make you want to come back for more. We believe entertainment games should not be addictive empty vessels of fun. Embody your game with something real, a bit of passion. Have you got an idea for a game that simply has to be made? We can help you. Woven is a puzzle adventure game in which you explore a knitted world where stuffed animals live. Although the game is kid friendly it aims at a broader audience. Think of Shrek in a woolen outfit. As a player you continuously customize your character by mixing different body parts to solve puzzles and confront the dangers that lurk beneath the soft surface. In Woven you find a world consisting solely out of wool, cotton and fabrics, you control a mysterious little metal robot named Glitch and meet Stuffy, a stuffed animal in the shape of an elephant. Woven is a game about friendship, adventure and creativity. In The True Tales of Bloodstreet 13 you follow detective Deacon Darnell as he tries to solve the case of the horrific night on Bloodstreet 13. On that night a group of people got locked in a brothel with no means to escape. Uncover what happened and who or what was responsible for the horror that took place, and what role history takes in what happened. We are currently looking at how The True Tales could take its next step towards chapter 2 and if finding the right publisher could be a part of that step. We love gripping storytelling, immersive environments, and everything VR. When we tried on the wireless HTC Vive that enables you to freely walk in – and manipulate – 4 square meters of Virtual Reality, we simply had to do something with it. Wizard VR – Dante’s Hell was the fruit of a creative sprint. A playable demo of an arcade like shooter in which you work your way through waves of demons on your way to the depths of hell, armed with nothing but your hands. Hands that can throw fireballs. The king is in dire need! His coffers are running empty and that damned daughter of his has yet to be married off to some rich nobleman. The time has come for a father and king to take a stand! There will be a tournament for his daughter’s hand! Let the brawling begin and let’s get this thing over with…. In Dragons and Damsels everyone participates in the great tournament to determine the fate of the poor princess… Including the princess herself! She won’t stand idly by while some brute kills another brute and wins her hand in marriage, no! She has donned her armor, taken up the sword herself and secretly is one of the competitors in the tournament. Dragon and Damsels is the second Intrigo game by Alterego Games and currently undergoing final testing. In Mutineers of the Seven Seas players get the chance to gather and get into the role of one of the scumbag pirates of the ship: The Leaky Dutchman. Can the buccaneers, faithful to the captain, see how the mutineers are hinting at each other? Can the Mutineers reach their victims quiet enough and in time? Mutineers of the Seven Seas is thrilling to play and offers a unique experience every time. The game can be instructed easily to other players and is developed for groups of 7 and larger. Perfect for a night of fun and laughs with friends, family, birthdays or other occasion. 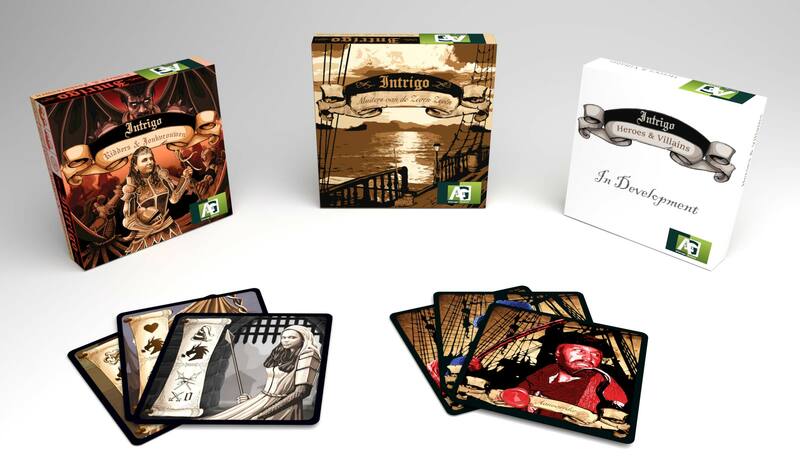 Mutineers of the Seven Seas is the first intrigue game by Alterego Games in a line of Intrigo Games. It is currently out in the Netherlands. Find it in your local game store. New Rotham is a city full of crime and mischief, the perfect place for Heroes and Villains to make a difference. The league of Evil and the League of Justice fight each other for control of the city. But in some Villains, a little bit of Good remains while in some Heroes, a small amount of Evil slumbers. Villains and Heroes may need each other’s help to finish their own goals. Each player chooses three powers and together they form a team of junior heroes. Over the course of the game players receive three hidden goals for either Evil or Justice, defining your characters hidden allegiance. The team who finishes all their goals first, wins. Heroes and Villains is the Third installment in the Intrigo series and is currently in development.